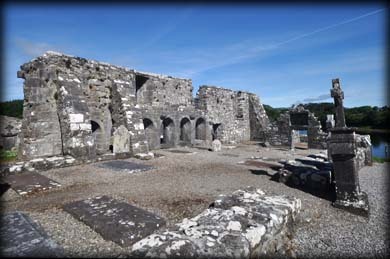 St Mary's Dominican Friary in County Mayo is beautifully situated on the northern banks of Clew Bay about two kilometres west of Newport. 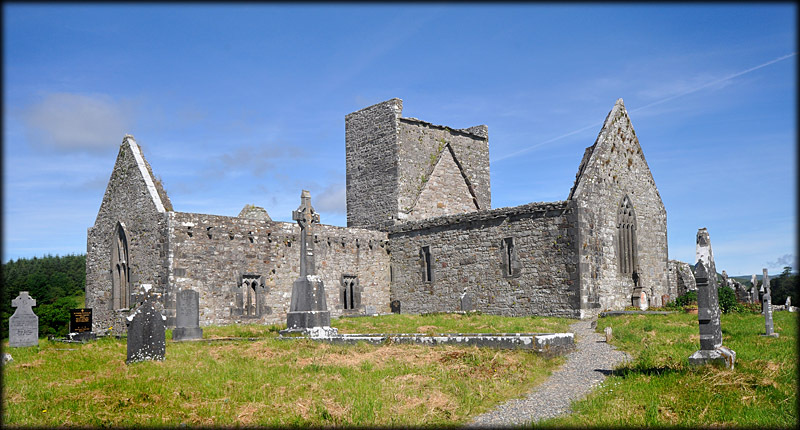 The Friary was founded in 1469 by Richard de Burgo of Turlough, MacWilliam Íochtair (Chief of the Lower MacWilliam Burkes). He hastily built the friary without getting permission from the Pope, an act that could result in excommunication. Richard surrendered his Lordship and retired to the Friary taking the habit of the Dominican Order for the remainder of his years, he died just four years later in 1473. 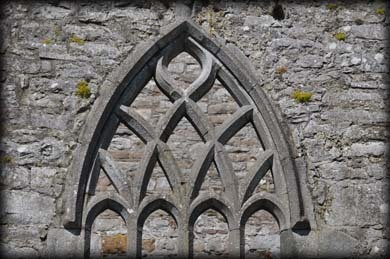 The Friary was not recognised until 1486 when Pope Innocent VIII granted a brief of foundation. 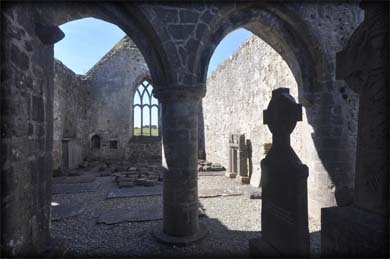 The friary was dedicated to St Mary and the friars absolved from excommunication. 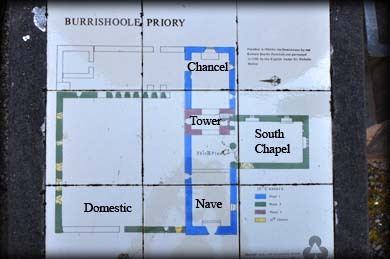 All that remains of the friary is the nave and chancel church with a low squat tower and south transept, plus the eastern wall of the cloisters. The other domestic buildings, refectory, kitchen, and dormitories etc have all been destroyed. 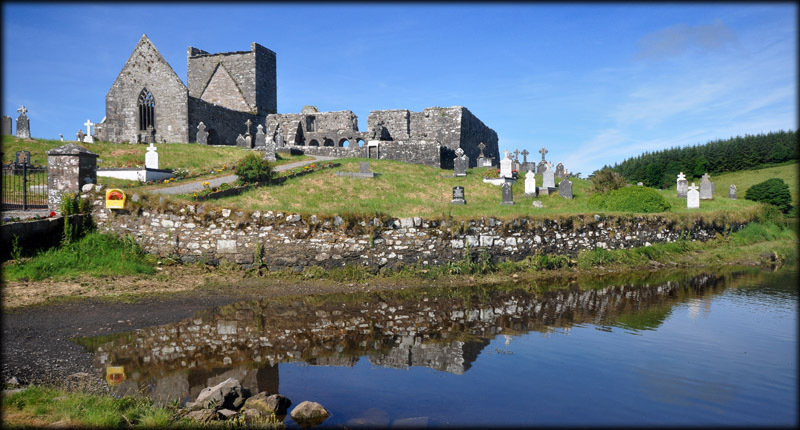 This is one of the most tranquil sites I have visited to in Ireland. I spent quite a lot of time just wandering around the building looking at the large variety of windows and portals. 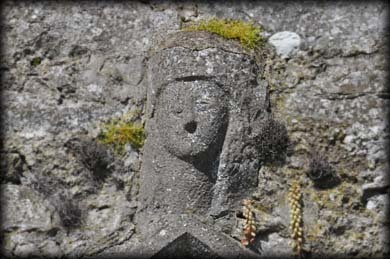 There are a few carved heads to be found dotted around the Friary. 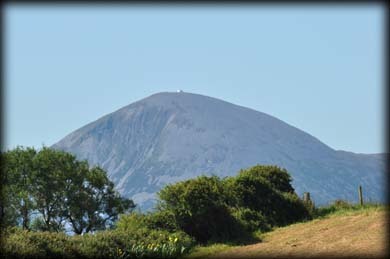 Croagh Patrick can be viewed to the south across the bay. Discovery Map 31: L 9666 9553. Last visit June 2014.